CRM organizes two types of schools for advanced students, potsdoctoral fellows and young researchers. The first type includes schools on fundamental issues that have a significant impact on training at the highest canadian and international level. The best examples are the series SMS-NATO Summer Schools Advanced Study Institute which started in 1962. The second type comprises all preparatory schools for workshops and conferences held within the long and short theme year programs at CRM. They provide a means to draw the maximum benefit from the presence of specialists in a given theme, by ensuring that students have access to the most recent developments. 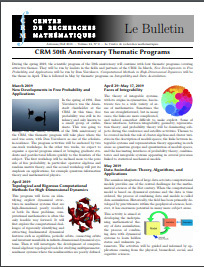 A typical example of this type of school is CRM-Clay School in Additive Combinatorics, which preceded and prepared for the great workshop on the same theme.